Hoses are an integral part of any hydraulic component, and often they’re the first to go when wear develops over time. Fortunately, Gregory Poole offers fast and reliable hydraulic hose repair, replacement and other services. You’ll find we have a comprehensive selection of hoses and couplings in stock, and can quickly turn around any job. At Gregory Poole, going the extra mile for our clients isn’t just an idle promise. We stand behind our words and commitments. 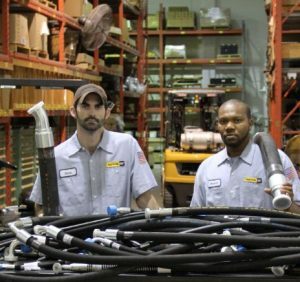 We offer an exclusive 30-minute hydraulic hose assembly guarantee out of our Raleigh, North Carolina service location. Visit us, and we’ll take care of any in-stock hose replacement or repair while you wait — no appointment necessary. As the only authorized Cat® dealer serving our region, we have one of the largest OEM parts selections in the country. We have an extensive stock of low-, medium- and high-pressure hoses and fittings ready to install on your heavy equipment. Reliable service — We get the job done right the first time by following official Cat guidelines for replacement. High-quality results — We thoroughly test every repair to ensure it delivers the performance and reliability you require of it. The best parts — We use only genuine Cat parts made from quality materials that deliver higher temperature tolerances and lower lining swell than aftermarket alternatives. Contamination-free repairs — We perform all repairs in a clean environment to eliminate the risk of contamination. We are your one-stop hydraulic hose repair shop for all Cat equipment and machines by allied brands. We offer pickup and delivery to anywhere in eastern North Carolina, as well as dedicated hose repair service out of our Raleigh location. Call or stop by today to request a free quote.